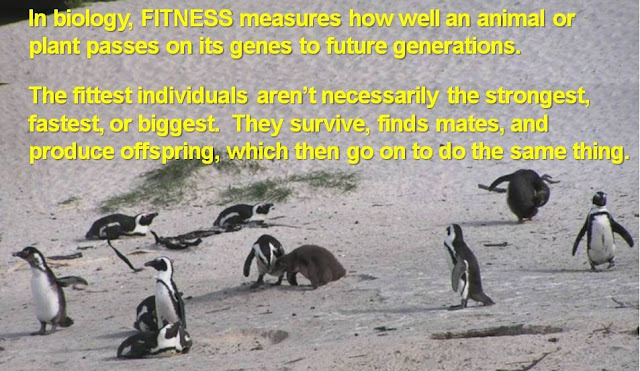 All-species fitness: What's small and resembles a hammerhead shark? These fearsome killing machines are dragonflies, even more successful than those ambush predators we've explored here previously, the seahorses. They eat one-fifth of their body weight every day (and much of that is mosquitoes – nice). What makes them such successful hunters? How do they do it? Focus. Ambush. And some great adaptations that have stayed with them over the last 320 million years. Focus: They have compound eyes that cover most of their head and brains that focus primarily on processing visual information. 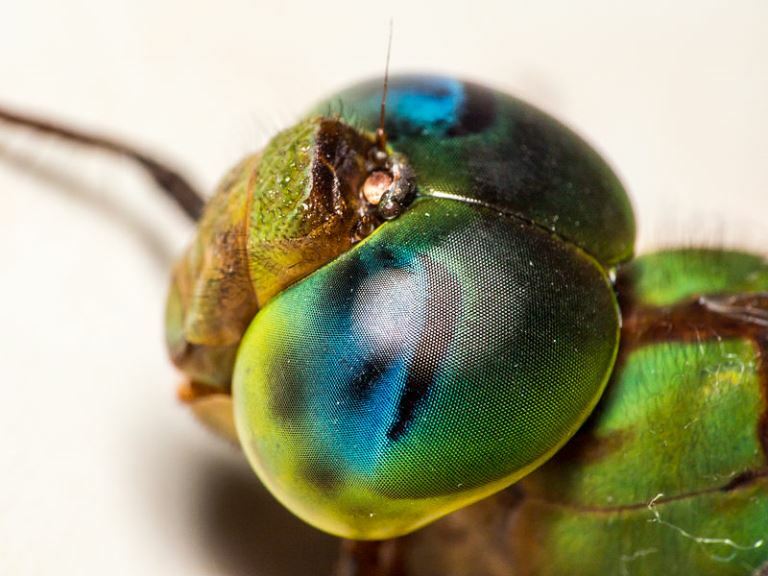 This killer combo gives dragonflies exceptional eyesight that includes nearly 360-degree vision — they can their prey in front of them while still watching you behind them. Ambush: Dragonflies ambush their prey by grabbing it from below or behind, and they will take nearly any type of insect, including bees, butterflies, and sometimes their own species. They can focus on one thing at a time and hold that focus even while both they and their prey are moving. 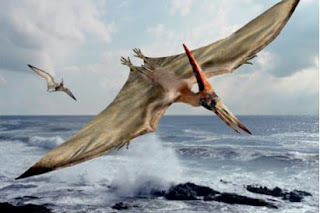 They use this ability to plot their flight path to intercept the prey from behind, below, or on an angle, grabbing, and sometimes going ahead and eating, prey on the fly. So, yes, they are tiny and shiny, but they are also voracious, single-minded predators that, like sharks, Or lions. One more key adaptation – the copter design: You know a member of the order Odonata when you see one. 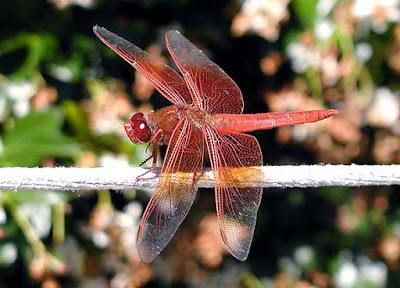 They have that characteristic double pair of wings, each of which moves independently using its own muscles, which allows a dragonfly to move like a mini helicopter — it zooms upwards, hovers, pivots, and flies in any direction, and thus is a focus of US military strategists looking for the next best drone design. those characteristic 2 sets of wings, each of which is controlled independently. and its extra weight allows dragonflies to glide even at high speed. As New York Times journalist Natalie Angier reports: "...the four transparent, ultraflexible wings are attached to the thorax by separate muscles and can each be maneuvered independently, lending the insect an extraordinary range of flight options." They can outfly other insects — have a look! OK, it's corny, and jiggles a bit in the beginning, but this Smarter Every Day video breaks down and slows down dragonfly flight and why they outmaneuver other insects. Learning made easy peasy. How DO dragonflies resemble hammerheads? It's those wide eyes and voracious predatory hunting style, I would say. You'll find the answer at 1:35 in this episode of Secrets of Nature (a 48-minute program for anyone wanting to know more about these "sky hunters"). The video has super-slow-motion footage of their unique flight mechanics, which contribute so much to their hunting success. I, for one, have always been curious about how dragonflies coordinate those two sets of wings in flight. 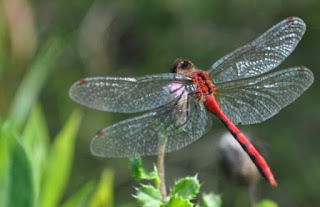 Here is that lovely and long Secrets of Nature video, for when you time to learn everything you ever wanted to know about dragonflies and damselflies and weren't afraid to ask and get the full answer! So why haven't dragonflies taken over the world? Dragonflies do have weaknesses, and one is predators -- many birds, frogs, fish, and lizards catch and devour these fat-bodied insects, as do other dragonflies (those cannibals). Another is life expectancy - adults typically live for 2-8 weeks (though the larvae live in the water for years!). They nearly always breed near fresh water! This brings us to their third weakness: their need to live near water to reproduce. 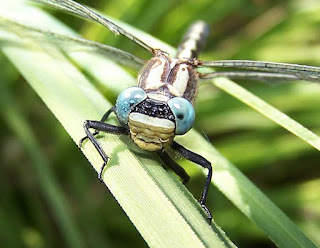 Females lay eggs on plants, rocks, or mosses and must be close to fresh water because the larvae, known as nymphs, of nearly all dragonflies live in water. This dependency on water makes them vulnerable to extinction because people use fresh water so intensively for agriculture, transportation, and, sadly, waste dilution. They are also sensitive to pollution, further limiting their ability to share turf with people. 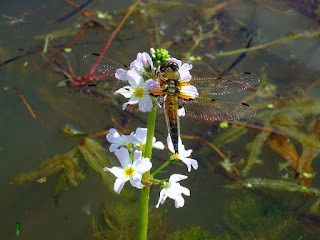 If you see a number of different dragonfly species in a place, that's a good sign that the ecosystem is healthy. The role we humans play in destroying the homes of big mammals makes the news, but as we plow, pave, and pollute forests, grasslands, and rivers, we also destroy the preferred riparian habitat of even small critters like dragonflies. What's the difference between a dragonfly and a damselfly? An easy-to-read NY Times article on some of the adaptations that give these "pretty and deadly" dragonflies their keen abilities. I couldn't embed it, but the slow-motion scenes in this article's quick video are another fun look at how the dragonfly ambushes its prey.